NRDC-ITA NATO - 22nd April - NRDC-ITA visits Fiocchi, hunting ammunition and cartridges factory in Lecco. NEWS > ARCHIVE > Archive 2016 > Archive 2016 - 04 > 22nd April - NRDC-ITA visits Fiocchi, hunting ammunition and cartridges factory in Lecco. 22nd April - NRDC-ITA visits Fiocchi, hunting ammunition and cartridges factory in Lecco. 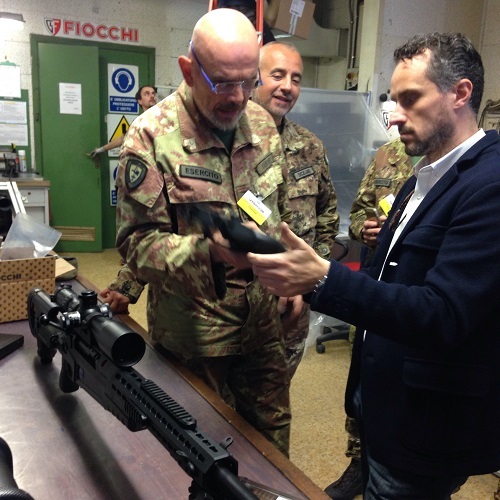 The NRDC-ITA Commander, Lieutenant General Riccardo MARCHIÒ, and NRDC-ITA Chief of Staff Maj. Gen. Giovanni MANIONE, have payed visit to Fiocchi, hunting ammunition and cartridges factory in Lecco. Founded 140 years ago by Giulio Fiocchi, the company is nowadays standing out at world level in the production of all types of ammunition for handheld firearms. A complete variety is currently produced in the factory, for sport, hunting, security and military application up to 12.7 mm. Stefano Fiocchi, President of the company, has proudly described the production process, from the raw material to the fisnished and polished ammunition round, done with the maximum consideration for reliability, shooter health and environmental protection. The visit represents an added value to strengthen the relationships between the NRDC-ITA and the socio-economic reality in the region.